After 68 years of independence, the current situation of Pakistan shows that peace has now become a dream. It is sad that the country is presently suffering from the worst conditions. Terrorism, unstable governance, corruption, shortage of electricity and petrol, an economy in shambles is a short list of problems 180 million Pakistani’s live through day by day. In spite of all of these, the saddest and most difficult to fathom issue we face is without a doubt that of ethnic and sectarian violence. The projects on Peace building are the desire need of a country today but Peace building requires “Peace Builders” who are willing to contribute to society. In order to build peace, it is crucial to identify activists and likeminded people who can have a sense of fulfillment by contributing to harmony. The only solution is to provide peace education to our children and youth could result peace, harmony and development in the society. Caritas Pakistan has been implementing a Peace Building Program since November 2012. The program provides students and young leaders with the opportunity to obtain a unique and in-depth perspective on the realities facing in Pakistan by engaging in dialogue, cultural exchange, formation of children’s peace clubs and create awareness about peace building through trainings, sports, theatre and exposure visits. Caritas Pakistan is providing peace education in forty schools of eleven districts in Pakistan including Sialkot, Gujranwala, Narowal, Bahawalpur, Rahim Yar Khan, Vehari, Bahawalnagar, Hyderabad, Mirpurkhas, Sanghar and Tandoalahyaar. It also provided an opportunity for the students to know about the basic issues of the society and make them able to resolve these issues such as Gender Balance, injustice, child labor, usages of drugs and children’s rights. The First Phase of the project started in November 2012 as a pilot phase in three diocesan units of Caritas Pakistan including CPL, CPM and CPH named as “Peace Building Programme”. The mission of the project has to be a meeting place for building networks of knowledge, support, and advocacy in regions experiencing communal violence and hatred. In this regard, Caritas Pakistan jointly started the project in the schools located at the bordering areas of Pakistan. Initially, Caritas Pakistan started the project with eighteen schools in six districts of Pakistan but after having an overwhelming response from various schools who wanted to be a part of the Project; Project was extended in January 2014 named as “Peace Building Programme – Phase II”. The outreach of the project extended from eighteen to forty schools and from six districts to eleven districts of Pakistan. During the first two years, the program was established, staff was hired, schools were identified and selected, peace clubs were formed, awareness sessions, peace sports gala, theatres, exposures (national & international) and festivals were organized in which large number of students participated. 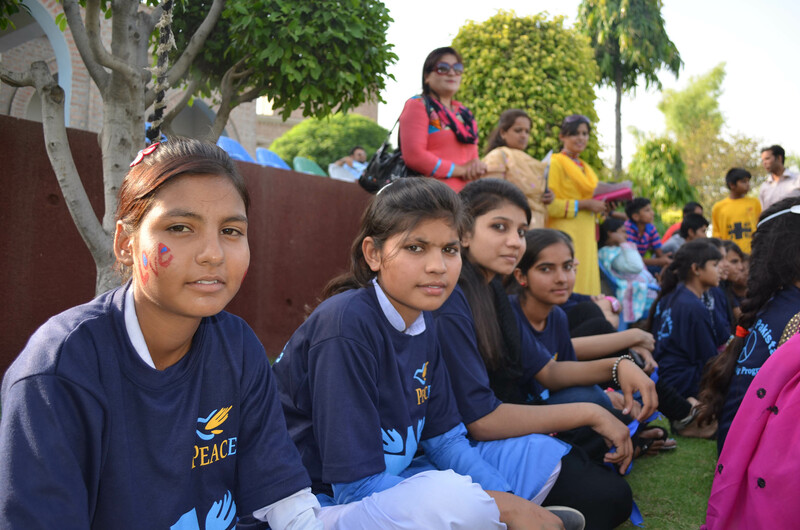 Schools wanted to be a part of CP-Peace Building Intervention; as it involves much learning and fun activities through which Caritas Pakistan is promoting peace education in various schools and producing “Peace Ambassadors” in Pakistan. Each school spares one period for peace education in which students are taking keen interest and the number of students in this class have increased day by day. Students and teachers provided their experts opinions during implementation of activities which refined and generated new interventions in the project for the upcoming years. The peace clubs in schools are now self sustained and implement activities by their own and we believe that this process will continue in upcoming years with multiplier effect. Hence, Caritas Pakistan will be focusing on the capacity building of students and teachers in its upcoming endeavors. During the implementation of peace building program; CP indicated that the country requires PEACE especially peace building & social harmony campaigns and processes among our school children, teacher & parents, youth, religious scholars, journalists, Govt. & non Govt. officials, civil society organizations and media representatives. In this regard, Caritas Pakistan has now designed a three years plan for its new project on “Peace Building Initiatives for Conflict Prevention, Interfaith and Social Harmony in Pakistan” which will further focus on children, youth and community stakeholders to work directly at community level for social harmony with wider scope and outreach. Peace building, peace promotion and peace education are long term and multifaceted endeavors. Building sustainable peace requires specific skills in diplomacy and conflict resolution, but it also implies implementing ambitious educational processes for future generations. Promoting sustainable peace involves teaching; learning and transmitting a set of values that help transcend political, social, racial and religious differences that, today, are often at the origin of conflicts. The current project of Caritas Pakistan’s on “Peace Building Initiatives for Conflict Prevention, Interfaith and Social Harmony in Pakistan” is addressing the underlying causes of conflict to initiate social transformation process and empowering civil society institutions, youth, children and community members to act as actors of change. We consider conflict prevention as an integral part of our efforts to help communities reduce poverty, promote economic growth and improve people’s lives, in the context of sustainable development. Through this project we intend to promote a culture of conflict prevention in our work with communities. The goal of this project is to build a society where people choose nonviolent means to achieve greater justice and sustainable development. The project is designed by keeping in view that the sustainable peace and harmony can only emerge when people feel that the peace process is their own and not eternally imposed. We believe that strategies and initiatives to address conflict should generally be locally derived. The project will focus to build on capacities that already exist at the grassroots level, not duplicate or displace locally developed initiatives. The project also aims to improve the social conditions in the country in order to facilitate positive social transformation by involving communities, civil society organizations, youth and media at the diocesan level by building local capacities. It is designed to provide students and young leaders with the opportunity to obtain a unique and in-depth perspective on the realities facing in Pakistan by engaging in dialogue, cultural exchange, peace building awareness with local communities. The activities are designed to involve youth, women, students, teachers, religious scholars, journalists, government & non-government officials and civil society representatives who can play a vital role in promotion of social harmony in target areas which can result in bringing peace and development among the target communities. The project activities include workshops, meetings, TOT, awareness programs, involvement of school children, teachers and youth, peace education for families, meditation and reflection sessions, peace walk, international peace day celebration, involvement of media, animation, candle vigils, peace convention, women programs, and documentaries and movies. • Focusing on strengthening harmonious and respectful coexistence of faith communities, both inter faith and intra faith. • Focusing on building capacity on conflict resolution and reconciliation efforts in conflicts. • Focusing on awareness creation within society at large and faith communities in specific on the potential of the faith communities in peace building. • Facilitations of peace building processes. Focusing on networking, nationally and internationally on interfaith dialogue and cooperation to secure experience sharing and joint efforts. • Facilitations of peace building processes.